Dini's kosher restaurant in Beijing plans to be open 24 hours a day, seven days a week during the 2008 Olympic Games. BEIJING (JTA) -- Gold medalists won't be the only ones climbing podiums in Beijing once the 2008 Olympic Games are under way. Isaac Shapiro will be stepping up to celebrate his bar mitzvah. Isaac, of Highland Park, Ill., will be called to the Torah at the Chabad House in Beijing on Aug. 16. Isaac and his family are among the hundreds of Jewish tourists, athletes, dignitaries and media expected to converge on the Chinese capital for the 2008 Olympic Games, which begin Aug. 8. While most visitors probably don't even realize there is a local Jewish community in Beijing, the resident Jews of China's capital are getting ready to welcome anyone who seeks them out. The Shapiro family was already planning a trip to Shanghai and then to the Olympics, motivated by Isaac's love of sports and his older sister Chloe's previous career as a competitive gymnast. When Isaac's bar mitzvah tutor in Chicago, a photographer for the Games, suggested he have his bar mitzvah in Beijing, it all clicked. Isaac's father, Sam, said the family didn't feel the need for a "big American bar mitzvah." Sam Shapiro offered many reasons for the off-beat choice of his son's bar mitzvah location. "It will give Isaac a wonderful sense for the Jewish Diaspora," he told JTA. "We also wanted to give our kids a better understanding of China since it is rapidly becoming one of the most important countries in the world." While the bar mitzvah will make the second Shabbat during the Olympics an especially lively affair (in Chinese, they would say "renao") at the Chabad House, the local rabbi expects a big crowd the prior Shabbat as well. Rabbi Shimon Freundlich of Chabad Beijing said he expects a packed house in the already squeezed villa living room of the main Chabad House, which is converted into a shul with mechitzah separating men and women every week. He said he has been contacted by tourists from all over the world, including Australia, Israel, the United States and Europe, and even by some athletes directly. Without naming names, Freundlich did divulge that "there will be athletes at services." "It will be packed wall to wall, no question," he said, noting they couldn't find a larger hall because everything else was booked. Chabad will offer services three times a day every day during the Games, Freundlich said, at both the main Chabad house and the Central Business District location. The main Chabad house will also display a special Sino-Judaic exhibit of artifacts belonging to Jews around China in the last 200 years, including books, photographs and religious items like a Hannukiah from Shanghai. While the Chabad community will be bustling, all signs indicate that the egalitarian, lay-led Kehillat Beijing minyan will have its share of visitors. Almost one-fifth of the total 18,000 hits on the Kehillat Web site (www.sinogogue.org) came during the month of July alone. Kehillat will only meet on the Friday nights of Aug. 15 and 22. The minyan decided to cancel its Shabbat services the night of the opening ceremony, figuring that Olympic guests might plan to attend the show-stopping event. Even Kehillat regulars might find it hard to travel that night or simply might opt to watch the event on television. Kehillat Beijing does not have regular Saturday morning services. Athletes and tourists alike will be taken care of when it comes to kosher food, thanks to months of preparation leading up to the Beijing Summer Games. There will be a place inside the Olympic Village for those seeking kosher food and prayer services. There are five places in the Village that will host religious activities, for Hinduism, Buddhism, Islam, Christianity and Judaism. 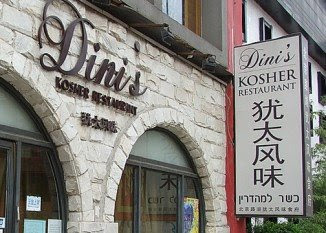 In the city itself, Dini's Restaurant, mainland China's only kosher eatery that is not part of a Chabad House, will be open to customers 24 hours a day, seven days a week. On Shabbat, meals are served after services. Over a period of several months, Dini's was visited by South African shochet Rabbi Chaim Klein, who in total prepared over seven and a half tons of beef and nine tons of chicken. "Everything is slaughtered and in the freezer," Freundlich, the Chabad rabbi, told JTA. Five rabbinical students from Australia, South Africa and the United States will come to Beijing for the Games to help at the restaurant, as well as perform tasks like delivering food or greeting people at the airport. As a special Olympics precaution, the restaurant has hired a 24/7 security guard. In addition, Dini's will make deliveries to hotels all around the city. Available for sale at both Dini's and Chabad locations will be a 65-page English-Chinese travel booklet made by Chabad, with helpful tips especially for Jewish tourists. The Israeli Embassy in Beijing is preparing an informational letter of its own for Israeli tourists, with a guide to the city and useful embassy information, according to the embassy's press officer, Guy Kivetz. The embassy will provide support not only for Israeli tourists but also for the more than 20 expected journalists from Israel. Israel is bringing its largest delegation ever to the Olympics, with 42 athletes. Of course, security is always a concern. "To host an Olympics is not easy security-wise," Kivetz said, "but we are confident in the measures that China is taking, and Beijing compared to other places is considered to be safe." The Israeli Embassy will also host an event Aug 18 with the dual purpose of commemorating the 11 athletes killed at the 1972 Munich Games and welcoming the Israeli Olympic delegation.